That Saturday, I left the bank as usual at about two o’clock and went straight down to Safina Restaurant, on the ground floor, where I wolfed down a half-plate of rice and chicken curry. Safina Restaurant was my regular eating place in Chemmad, primarily because it was the only restaurant in the whole town. Not that I ever had cause to complain about its fare. The Safina menu was limited but nutritious. Usually, I breakfasted on eggs and Malabar paratha; lunched on chicken biryani; and dined on chicken curry and rice. For variety, I sometimes lunched on chicken curry and rice and dined on chicken biryani. When in extravagant mood, I sometimes had an omelet with my chicken curry and rice. Safina’s owner and head chef, Haji Mohamed, was a friendly and solicitous host, ever ready to sit with me and chat while I ate, and quite tolerant of my occasional forays into his kitchen to modify or experiment with some dish. Thanks to Haji Mohamed’s fare, I gained three kilos during my five-month stay in Chemmad. Presently, a Calicut-bound bus came rattling down the highway—like most of its kin, a private bus operated by ‘Vengara Roadways’ . I boarded the bus and found a seat. Seated next to me, at the window, was an ageing maulvi with a deeply lined face and long, lustrous white beard. He had his eyes closed; his lips moved slightly in silent prayer. Most of the score or so other passengers were easily identifiable as Mohammedan by their kufi caps; hardly surprising, considering that Malappuram district’s population was predominantly Muslim. We rattled along a two-lane winding road through low, thickly forested hills and valleys carpeted with green paddy and yellow mustard. To the west, beyond and above the fronds of coconut palm and betel, banana and jackfruit, the glittering Arabian Sea stretched to an indistinct horizon, blue-green water merging and dissolving in blurry blue sky. It was hot; the sun beat down from a shimmering cloudless sky; the maulvi dozed off, his wizened cheek resting against the edge of the window. Calicut was only 30 kilometres away from Chemmad, but the journey usually took an hour or more. The driver slowed down the bus upon sighting any pedestrian or human habitation on or near the road, whereupon his assistant—a wiry, curly-haired youth wearing a red T-shirt and a lungi of incredibly bright pattern and hue—leaned out at a dangerous angle from the front door, banged the sheet-metal side of the bus and entreated prospective travellers, visible or otherwise, to board the bus with musical chanting of the names of all the villages and towns that lay en route. “Aiieeee, Kozikode! Kozhikode! Tenhipalam! Feroke! Beypore! Kozhikode! Aiieeee, Kozikode!” The driver also obligingly stopped the bus wherever and whenever a passenger wanted— to disembark, to exchange pleasantries with passers-by, to buy fruit, or simply to relieve himself. And so, in this wonderfully relaxed and friendly way, we trundled along. We stopped for over fifteen minutes at Tenhipalam, where the Calicut University is located. Many passengers disembarked here; a few boarded, and we moved on. As we drew nearer to Calicut, the traffic on the road perceptibly increased, as did the noise levels. We passed the industrial town of Feroke, crossed the long bridge across the Chaliyar river, and turned left to drive past the ancient port of Beypore with its thousand-year-old boat-building yards. 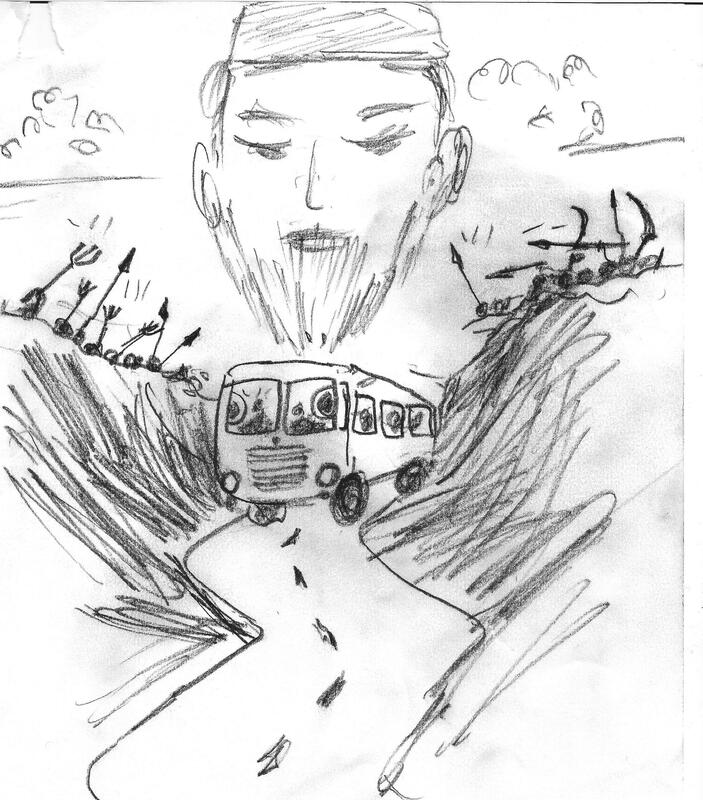 It must have been around 4 p.m when, with Calicut barely 10 kilometres away, the bus suddenly lurched to a halt. The maulvi started and opened his eyes. I peered down the aisle and saw, through the windshield, a row of buses, trucks and other vehicles standing on the road ahead of us, extending as far as the eye could see. The driver muttered imprecations and switched off the engine; the assistant hopped off the bus and walked off to converse with a small group of people standing next to the bus in front of us. He returned and exchanged a few quiet words with the driver, who stiffened visibly and then turned and announced something in Malayalam to all of us. At once, all conversation ceased, and an electric tension filled the atmosphere inside the bus. I didn’t understand much Malayalam then, but could gather the gist of what the driver had said. There was trouble ahead. And the trouble was drawing near, in the shape of an RSS procession. It seemed that the RSS—Rashtriya Swayamsevak Sangh, self-proclaimed defenders of the Hindu community—were angry because earlier that day, an RSS activist had been hacked to death in a village up north, not far from Calicut. The assailants were Muslim men. The assailants had been arrested—but the RSS was still in a rage over the incident. And they were marching down this highway, in a ‘show of strength’. I sat, silent as the other passengers were. Next to me, the maulvi had again closed his eyes in silent prayer. The afternoon sun poured in through the windows on the left. One by one, on both sides of the road, shopkeepers were pulling down their shutters. Only a few pedestrians hurried past on the pavement, heads down, urgency in their steps. The wail of a distant police siren wafted through the oppressive quiet, grew fainter and then vanished. After an interminable moment, the driver turned on his radio and fiddled with the knobs till he found a local Malayalam news channel. A woman newsreader mentioned communal tension in the Calicut area sparked off by the killing of an RSS man near Tellicherry, cheerfully adding that according to police, the situation was “tense but under control.” The news summary ended; abruptly Malayalam pop music blared forth from the speakers, shockingly loud. A voice from across the aisle roared something, and the startled driver switched off the radio. Silence returned. The pavements were now deserted. A few people leaned on the balconies overlooking the road. Black ravens sat on the telephone wires high above the road, still and watchful. And then I heard the drums, throbbing in the silent, still, humid air; soft at first, but growing louder and louder. Over and over again, on and on, the pulsating beat grew louder and louder till it was the only sound that filled the ears, the only thing that stirred the air, the only energy that filled the world. Automatically, the Timekeeper in my mind took up the beat: Ta-da-da-DUM. Dum. DUM-dum-dum. Ta-da-da-DUM. Dum. DUM-dum-dum. It was a driving, maddening beat, a funeral beat; a beat I had learned to play from King Crimson’s ‘Devil’s Triangle’; a beat that resonated with grief and desolation, with Fear and her demented brother, Rage. Abruptly, the ravens took flight with a rush of wings and raucous cries. And presently, around the edge of the bus in front, the marchers appeared and streamed past along the road. Almost all of them were young men, some barely in their teens: black caps on their closely cropped heads, mostly clean-shaven, clad in starched white shirts and outsized khaki shorts over white socks and black shoes. At regular intervals along the fluid column were rows of drummers. They were clad like the others, but had drums slung about their waists: huge bass drums, beaten with ferocity to set the pace of the marchers, and smaller kettle drums on which slender sticks played the off-beat funeral march. Ta-da-da-DUM. Dum. DUM-dum-dum. Ta-da-da-DUM. Dum. DUM-dum-dum. The marching column flowed past, seemingly endless; the marchers were silent, their muscles rippled as they swung their arms to the beat of the drums. Their faces were expressionless but their eyes flickered now and again towards the bus windows as they moved past us. I caught the glance of one marcher as he moved past: his eyes bored into mine, hard as stone, blazing like a lizard’s eyes blaze in the instant before its tongue lashes out to capture and gobble up a frail-winged insect. With an effort I looked away and stared at the back of the seat in front, frozen in body and mind. The marcher’s eyes were filled with hate. Hatred, for me. For us. For the marchers, we were all Muslims— I, we, all of us in the bus. We were identified as Muslims, if not by caps and beards, then by the name painted on the side of the bus. We were Muslims…like the men who had murdered their RSS colleague in Tellicherry. We were Muslims, and therefore regarded as culpable in that murder. Frantically, my mind wrestled with the sheer absurdity of the logic…even as icy fear grew like a wave and swamped the carefully constructed scaffolding of rational thought, self-control. Conscious of the moving column just outside the window, at the corner of vision, I stared blankly at the seat in front, fists clenched in my lap, neck stiff, legs feeling like water. Some of the passengers across the aisle had half-risen from their seats and were peering out the windows on our side, eyes wide, eager to catch a glimpse of the marchers yet anxious not to be seen. The tension and fear in the bus was now palpable, a smothering blanket. The sharp sound cut through the silent, fevered air like a knife. It was the sound of metal sliding on metal; it had come from across the aisle. I turned and saw a young man half-risen from his aisle seat, about three rows ahead. His eyes were on the marchers. His left hand gripped the top of the seat in front; in his right hand was a straight-bladed sword, about two feet long. Where he had pulled the sword from, I had no idea. To his left, at the window on the far side, crouched another young man; even as I stared at them both young men turned and looked at me. And their eyes were as hard, as blazing and pitiless, as reptilian as the eyes of that RSS marcher outside. I tore my gaze away and looked out the window on my right, and then at the seat in front. They are Muslims, a voice in my mind shrieked. They know I am not a Muslim. They see me as a Hindu; as one with the RSS marchers out there, whom they hate. To them, I am a Hindu…and therefore, equally to be hated. The heavily accented Hindi words were soft, almost a whisper. The maulvi’s eyes were calm. Do not be afraid. We are all One. We are all One before the One. Like mist before blazing sunshine, my fear vanished. I drew a deep breath and looked out the window, where the last of the marchers were striding past. I looked across the aisle; the young men were seated now, chuckling over something. As the driver started the bus and turned on the music, I looked up at the maulvi. He nodded and smiled, and then closed his eyes, lips moving in silent prayer.